Taylor Hiskey, Social Media Director for Urban Decay Cosmetics and Pierre-Loic Assayag, CEO and Cofounder of Traackr, at WWD's Digital Forum. I recently attended WWD’s Digital Forum where the topic of influencer marketing (IM) was mentioned by nearly every single speaker. However, the approaches to IM described varied widely. On the one hand, some discussed “using influencers” for launches, while others described more advanced IM strategies founded on long-term relationships, data-driven influencer evaluation and a dedication to influencer marketing performance measurement. Taylor Hiskey, Social Media Director for Urban Decay Cosmetics (UD) and Pierre-Loic Assayag, CEO and Cofounder of Traackr, took the stage to talk through how UD has managed to thrive for years despite the shifting influencer marketing landscape. At the core of Taylor’s message was this: If your brand doesn’t evolve from transactional to relational IM, you’ll never see the full benefits or experience a meaningful ROI from your influence investments. Taylor explained how UD’s approach to IM has equipped the brand to roll with the constantly evolving world of influencers. Relationships: Influencer relationships are cultivated over the long haul instead of starting from scratch with every launch. This gives the brand an advantage, not only for launches, but during the time between launches as well as their influencers have a strong organic affinity for the brand. 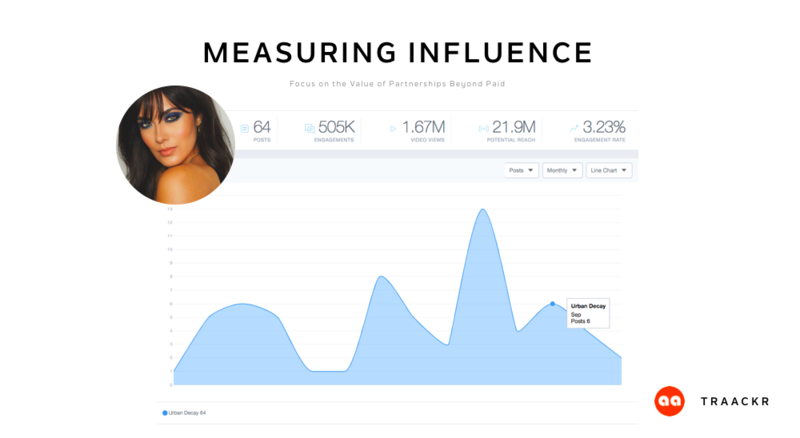 Measurement: Taylor measures the value of a paid partnership by the level of organic results UD’s influencers generate. While paid partnerships are an essential part of an IM mix, the greatest ROI is measured by the impact those influencers generate outside of their contractual requirements. Taylor highlighted UD’s work with Melissa Alatorre, whom they have work with for years and has performed across paid, earned and owned. Not only does Melissa produce exceptional content, but she achieves measurable results on a consistent basis. Product launches and events are essential, but it’s that ongoing organic brand affinity that delivers the steady drumbeat of attention grabbing content brands need to impact their consumers. 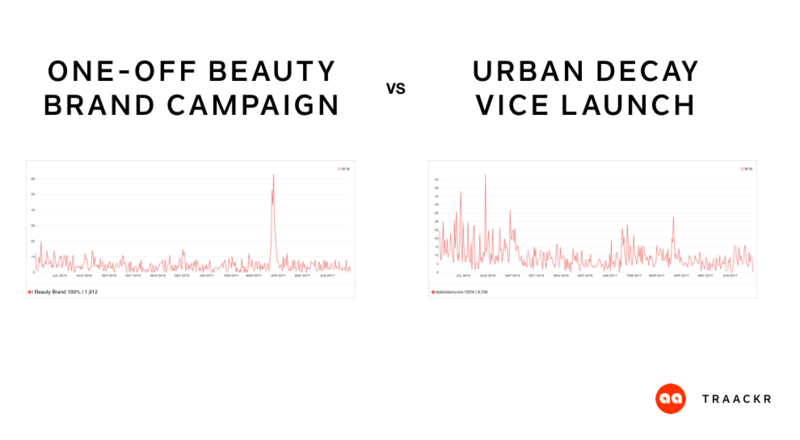 To visualize the impact of relational versus transactional IM, we compared one of UD’s launches to a similar launch by a competitive beauty brand. The data shows that if you have solid relationships with your influencers, they continue to drive results long after the launch is over. Whereas if you treat influencers solely as tools for getting your message out, the impact is minimal. You’ll see your contractually obligated spike, but it’s likely that will be the end of it. Influencers also understand the value of long-term relationships. 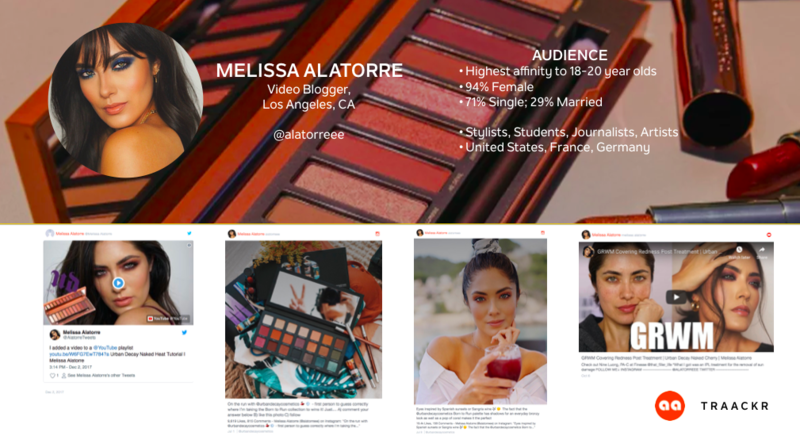 In our report, Global Influencer Marketing: Insights from Beauty, we studied average influencer audience growth and found that less than 30% of beauty influencers will grow their audience by more than 50% in a year. Not to mention, roughly 10% will actually lose audience. Influence is hard to earn, easy to lose and the winners play the long game. The end of the year is always a great time for reflection. Coming off WWD Digital Forum, I thought back to all we’ve experienced in the influencer industry this year. From algorithm modifications, global acknowledge of fake influence and the culprits, to the first “failure to influence” lawsuit. It’s been intense! But it’s also been a year of maturation. Investments are increasing and so is the scrutiny on the practice from the highest levels. Influencer marketing measurement is top of mind for everyone. What Taylor and the team at UD understand, is that relational IM equals results. I’ve spoken with teams at across consumer categories from beauty to consumer technology and many of them are talking about focusing their efforts in 2019 on building better relationships with the right influencers. This is also our focus at Traackr with our own influencer marketing strategy. So here is what I expect to see in 2019. An increasing focus on brands building meaningful relationships with influencers by working with them throughout the year. A stronger commitment to measurement as investments climb and having the data to select the right influencers becomes crucial. Larger in-house teams with more formalized influencer marketing roles centered around measurement, vetting and relationship-building. I’m sure there will be some surprises as well! We’ve seen new networks simmering in the background, niche ones, like Twitch, expanding beyond their founding communities and the expectant rise of the nano influencers. Whatever 2019 holds, it’s certain to be an exciting ride!